Okay, so my childhood wasn't deprived in 57,898 ways. 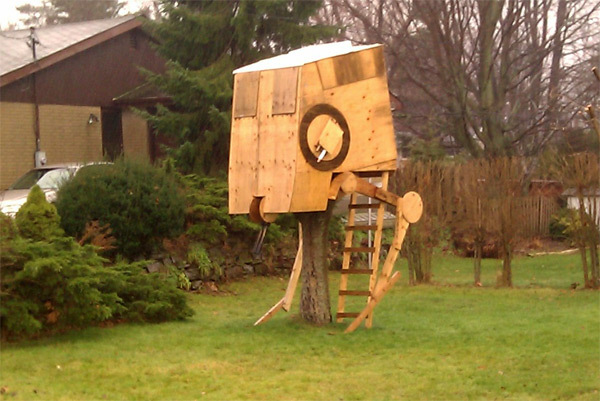 Just when I see things like this treehouse built of shear envy made to look like wood, it's hard not to feel that way. Don't you agree? I would've lived in that thing! Of course if your parents have this AT-AT custom-built liquor cabinet below, chances are you're going to need a place you can escape to outside, incase nights of spirit induced karaoke threaten to attack. Best thing I made of wood - a herb rack. Who uses those anymore? 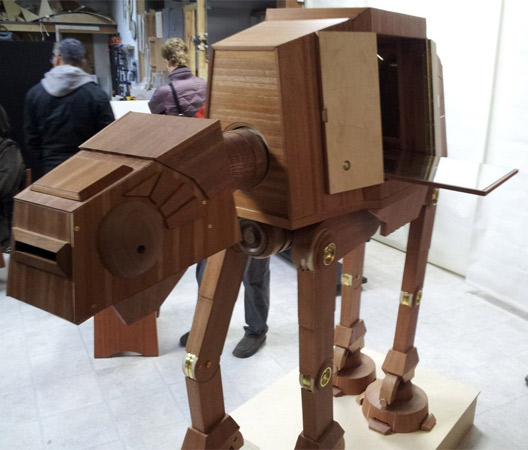 To see more of Colin Johnson's craft (the AT-AT guy) click here. AWESOME! the AT-ST was my favorite Empire Strikes Back vehicle when i was a kid. What is a herb rack? Is it a spices holder? Oh, and my brother would have lived in that tree house too. Mine too Dave. I had the original and the rerelease from the late '90's. That one ended up in Boy's toy stash though. Okay, I want the treehouse and the liquor cabinet. But the liquor cabinet would probably get more use right now. That is pretty amazing. I'm almost afraid to show the kids, they might ask if I can build it. Thanks everyone! Hey Random - maybe we could combine the two? That Liquor Cabinet inside the tree house... Then I'd just have to be careful getting down.... but hey, like they didn't have a few brews running round in the original metal monsters anyway! Aliera - yip you hit it on the head - herb rack/spices holder all the same thing. Unless it's built by an 11 year old with a hammer and a love for hammering nails into more places then required. Dave and Craig - the AT AT was mine - I don't think I'd forget that scene where they stride across Hoth's surface - even if my mind was wiped in a Jedi Mind Trick!